← Charles Poland Jr., An American of whom you could be proud. Model T of the air? This is a topic I have spent a lot of time thinking about over the last 25 years. Over time my perspective has changed with more experience, and knowing more about people and what their ambitions and goals are. I could write a small book on this topic, but let me just run some highlights past you as food for your own thought, and tie it in to your homebuilt project. Above, the model T, in production 1908-27, 15 million sold, Most influential motor vehicle of all time. The price actually went from $850 down to $260 during the production run. In 1914, the car cost about $450, and this was about the amount of money that one of Ford’s unskilled workers made in 3 or 4 months. This car was not the best one of its times, nor was it the fastest, or was it at the top of many other measures. Yet it was king on the only quality that mattered then and now for an influential product: affordability. 25 years ago when I was first getting started in aviation, I already knew that I wanted to work primarily in general aviation, personal aircraft had more interest to me than transport or military ones. Factory GA aircraft were essentially out of production, the last waves of production of the ‘affordable’ Pipers and Cessnas had already been sold. Their demise is often blamed on product liability, but if you look into it deeply, a lot of it is high inflation in 1979-81, the fact the IRS closed a loop hole that allowed rampant fraudulent write-offs of aircraft expenses, and the fact that huge corporations now owned the aircraft companies that were started by families, their ‘loyalty’ was to profits not affordable production are more to blame. At the time, people who dreamed of restarting America’s aircraft manufacturing predominantly hung around experimental aviation. I was new, but wanted any small part in a revolution that would bring planes that working people could buy. My motivation was partially selfish, I was a broke college student headed into the ‘get rich slow’ field of aircraft maintenance. If there was a single man who was the outspoken proponent and visionary of this time it was Leeon Davis. Many people might have thought I was going to type the name Rutan, but if you ever have a chance to read Davis’s book Where is my Dream plane? * you will understand why he was without peer on this. I had a chance to meet him in person just once, but I read just about everything he ever wrote on planes. 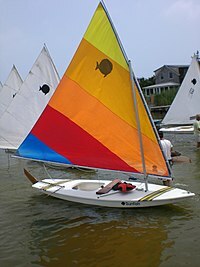 Here is an odd, but important connection: Above is the most successful sailboat of all time, the Sunfish. No other boat in history even comes close to the numbers sold, the number of people who learned to sail or the hours they enjoyed. It was not the fastest sailboat of its era, nor the best in any other way but one: It was affordable because it was a brilliant simple design that was mass producible. They went to molded fiberglass in 1960, eventually producing a quarter million boats. These boats produced millions of sailors, and a very strong and enduring sailing base in the US, complete with a lasting market for more advanced boats. Aviation magazines are always highlighting the best fastest, most elaborate planes with a moronic argument that these will stimulate aviation by getting people interested. Perhaps after decades of this fiction, we can dismiss it. You don’t build a pyramid by making the top block and expecting the base to appear under it. Lasting things are built from the foundation up. No person in sailing would make the foolish claim that the winner of the 1960 America’s cup, (which demonstrated itself as the most expensive and fastest sailboat ever) was important to sailing as the introduction of mass-produced Sunfish the same year. Yet this is the same argument we hear when the EAA puts a multimillion dollar TBM-850 turboprop on the cover of Sport Aviation. What men like Leeon Davis well understood was that aviation needed a Model T, (or my example of a Sunfish) not another expensive high-end plane. We didn’t get it, because in the short run greed wins, and you can make a lot more money producing things like Cirrus SR-22s, $300K C-172s, and $159K LSA planes with 912 engines. Davis made the argument that a real industrialist like a Ford, would understand that it is a 10 or 15 year plan, but it was an argument that was never going to sell to a corporate manager who’s bonus was based on quarterly income sheets. Aviation, and American manufacturing are not going to be saved by people with the “profit today at any cost, global cheap labor” mentality. When Steve Jobs, the founder of Apple died, TV journalists who know nothing of manufacturing, working people, and economics, mourned him as if we had lost one of the greatest lives ever, you had to wonder if they would have had as many good things to say covering the death of MLK or Lincoln. Amid this outpouring of love for the ‘saint’ that provided their Ipads and phones, A sole rational voice pointed out that Steve Jobs was not to be revered or even thought of in the same category as Ford or our other industrialists. The difference was simple: Ford had eventually provided a million Americans with a job that paid $10,000/yr. Steve Jobs did nothing for working Americans, because his model was to make 10,000 investors into millionaires, and have all the products made in China by people working as virtual slaves in toxic factories. He never gave a damn if anyone here had a meaningful job, just as long they had enough pennies to buy an Iphone and play video games. Ford was not my idea of a humanitarian, but he comes out that way compared to Steve Jobs who’s holy trinity was wealth, power and ego. I like to think that a design like one of Davis’s could re-ignite such thinking. It betrays that I am an optimist at heart, and it is a clue why I detest people who choose to be relentlessly negative instead of taking any small positive action. I read a book on current economics where the author pointed out that economically, Americans in 2013 can be divided into two groups: The 15% that came through the last 4 years, saw the market hit 14,000 and had all their investments come back, and the 85% who were squeezed into selling off 401K’s, investments and taking on more debt. His point was just about understanding that recessions are polarizing. Hard to argue against. If there was ever a chance that a large industrialist would get interested in building an affordable plane for working people, it gets a lot more remote when those same working people just went further into debt to just cover the basics. If you are in the first group, I am happy for you, it probably has a lot to do with how hard you work and how well you planned, and in many cases a bit of luck like your family staying healthy. If you are in the second group, and you have dreams in aviation, let me impress upon you the only thing you really need to understand: You can still do the things you dreamed of, but you will have to be more willing than ever to control the costs by doing more of the work yourself, choosing simpler, more pure designs, and being willing to learn more. You are going to have to be your own white knight on this. There will be people to offer assistance and a path, but you are going to have to take care of your own dreams. Make a plan, do not lie down while these fade. Seen from this perspective, you can understand why 95% of the businesses in our industry are only aimed at the first group of people. They are the easy people to sell things to. If you are one of the 85% who have less money than 2008, our industry still wants your membership, they want your admission fee at airshows, and they would like you to call your congressman when their lobbyists friends are trying to keep O’Hare and LAX open for the six seat light jets of celebrities, but they don’t really believe you are going to be anything more than a spectator in the system, a small source of revenue to them. They want you to just be happy reading about what other people are doing. Look at the magazines and compare then to 1960’s vintage ones, the difference is staggering. You can not learn about Model T’s and Sunfish by reading the work of editors who only cover Duesneberg’s and Yachts. Even looking at it saps motivation. *If anyone has a copy of, or knows where I can find “where is my dream plane,” I would like to buy it. The only one I know of is in the reference section of the Embry-Riddle library, and I would like to have a personal one. 4 Responses to Model T of the air? Great blog post, very thought provoking. I would have enjoyed meeting Mr. davis and pick his brain for a couple of hours…or days! Every time I get a flying magazine it is exactly like you wrote…some leather encased cockpit doing 300 mph at flight level 30. Even eaa magazine has only a few pages near the back that has building tips and hints. It would be nice to see something geared more towards prompting people to invest in “imagineering” time. I was happy to re-read this excellent post and it reminded me of another post William wrote some time ago, concerning the prices of aircraft, both built and kits. As he put it, there are thousands of people who would love to fly but circumstances have put them outside the lower margin of affordability, even for most kit aircraft. His point was that if you could reduce the cost of a kit by say 20%, you wouldn’t have just 20% more participation, you would have 50% more participation because there would be that many folks who could now afford a simple aircraft kit at the 20% lower price. Reducing the cost of aircraft available is the ONLY way we will save recreational aviation from a slow lingering death…..
Great post. I am fascinated with the design concepts of Leeon Davis. So much in fact that I am the new owner of the rights to the DA-2. I am working to resurrect the design by making plans available again. I am also in contact with Harold Davis to work out a deal to make Leeons book available again. It would be great if I could post a copy of this article on my website http://www.davisda2.com with proper attribution of course, if not I will at least provide a link to it. I feel this is an article that everyone interested in experimental aircraft should read.